Axl made the gig. Clapton joined the Stones. "Angie" entered the repertoire. Living Colour jumped into the Great Guns N' Roses bigotry debate. Those were the main twists on Thursday, the second night of the Rolling Stones-Guns N' Roses-Living Colour four-show stand at the Los Angeles Memorial Coliseum. The question on most people's minds going in wasn't what color Mick Jagger's jacket would be, but whether Guns N' Roses would play at all, after singer Axl Rose's declaration during the previous night's show that he was through with the band because of some members' excessive drug use. Sure enough, when GNR hit the stage on Thursday, Rose wasn't up there with the four musicians. What was up? Was the group trying to carry on without its charismatic leader? 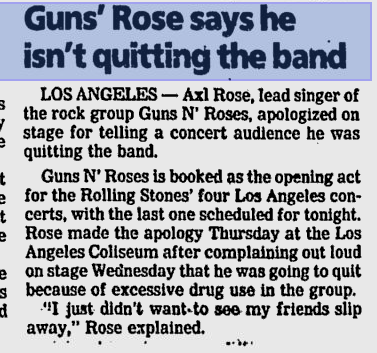 Before the music even started, lead guitarist Slash asked for the crowd's attention and launched into an extended discourse on the perils of drugs, admitting the group's transgressions but concluding, "Guns N' Roses is not gonna be a band that falls apart because of it." With that, Rose strode from the rear of the stage into the spotlight, to be greeted by a welcoming roar from the approximately 72,000 people on hand. After thanking Slash -- who was wearing a Betty Ford Clinic T-shirt -- for his statement, Rose the singer said, "I'd like to apologize for my actions and comments last night. I just didn't want to see my friends slip away." In the fiery set that followed, Rose and company were on their best behavior. He didn't fall off the stage, as he did Wednesday; he didn't dig himself deeper into racial controversy, as he did Wednesday, and he even thanked the Rolling Stones for having them on the show. The Stones wrote the book on that kind of thing in their early days, but now that they're an entertainment institution, no such scenarios are likely to be played out in their well-oiled "Steel Wheels" show. If you wanted spontaneity Thursday, you had to be thankful for small favors, like a brief microphone failure at the start of "Mixed Emotions" that proved that all the players up there were awake. Things were a millimeter looser Thursday, as Jagger did more bouncing off the other musicians, at one point wrapping the stoic bassist Bill Wyman in a makeshift wrestling hold. Set-list archivists note: "Angie" replaced "Play With Fire" in the show's slow-song segment, and Keith Richards inserted "Before They Make Me Run" before "Happy" in his spotlight turn. The clear highlight for the audience came during the opening bars of Willie Dixon's "Little Red Rooster," the slide-guitar slow blues they recorded in 1964. The video screens above the stage suddenly showed a close-up of un-introduced guest guitarist and fellow graybeard Eric Clapton, eliciting a mighty roar of recognition from the crowd. The Thursday concert began with another installment in the Issue That Won't Go Away: Guns N' Roses alleged bigotry. The band has been under serious fire for the racial and sexual epithets in the song "One in a Million," which they haven't been performing at the Coliseum. At the start of Wednesday's show, Rose tried to justify their use as social realism and deny that he is a racist, but once again revealed a profound obliviousness to the inflammatory nature of the language. Rose's Thursday apology didn't appear to cover those comments. Living Colour, the black, New York-based hard-rock band that has been at the forefront of attacking racism in rock, didn't have anything to say on the matter Wednesday, but on Thursday guitarist Vernon Reid stepped to his microphone and said, "It's been cool on this tour opening for the Stones, but some things were said on this stage last night that I have a problem with. "If you don't have a problem with gay people, don't call them (epithet). If you don't have a problem with black people, don't call them (epithet). I haven't met a (epithet) in my life." The Stones and their supporting sideshow play the Coliseum today and Sunday at 5 p.m. The headliners sing "It's only rock 'n' roll," but it's obviously more than that.